Happy Easter. What a beautiful Easter message. Happy Easter to you. It occurred to me that I should post on both blogs this evening rather than in the morning because it’s already Easter in your part of the world. I hope the day, and the season, are filled with blessings. She nailed that one! Happy Easter! Didn’t she, though? There’s always a new delight to be found in her work. Happy Easter to you, Terry. I see white triangles within a larger and darker one. Isn’t that cool? 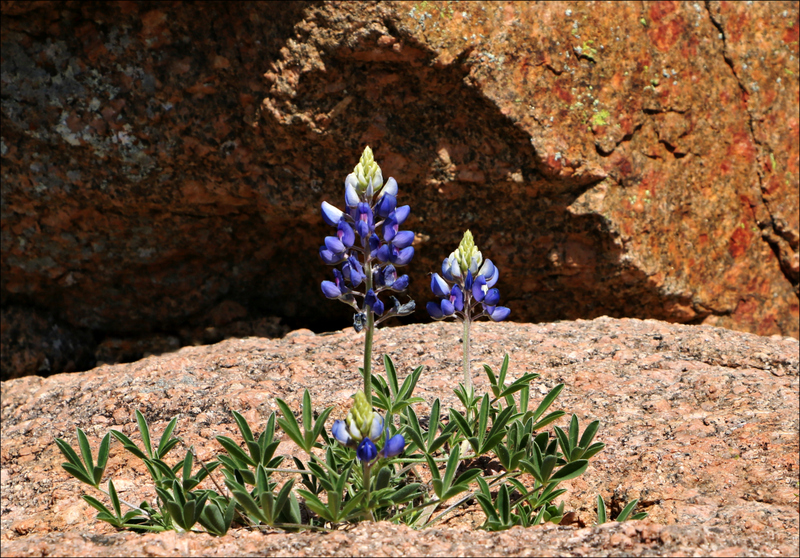 I was surprised to see bluebonnets growing there, and delighted that I managed to line up the bottom of their blooms with the edge of the rock. I didn’t see the dark triangle behind them until I looked at the images on the computer. I love the contrast of the blues against the shadow on the rock, and the intensity of the blues against the earth tones. When there are zillions of them in a field, they are just blue, but when you see a single plant in isolation like this, you appreciate the form, texture and shape, as well as the colors, of the plant. There is the old saw about not being able to see the forest for the trees. But it is also true about not being able to see the tree for the forest. And Mary Oliver. You don’t so much read her poems as absorb them, like gently touching a bead of water with the edge of a tissue. They just soak right up into you. It seemed to me that the bluebonnets I saw in this area (Fredericksburg, Gillespie County, and somewhat north) were more intensely blue than what we have here on the coast. I don’t know if that’s usual, because of soil or weather, but they certainly were lovely. I agree with you about the forest and the trees, in both directions. I’d only add that as for trees and bluebonnets, so with people. That’s a great way of describing Oliver’s poetry. I suppose she’s not to everyone’s taste, but she surely is to mine. It amazes me to see where blue bonnets will grow. Our lupine is a shy thing lurking beneath black oaks. Mary Oliver’s poems cut right to the heart of the matter, don’t they? Over the past year, I’ve grown curious about the Texas bluebonnet. The USDA map doesn’t show it as native in many counties where I’ve found it, and I’m not sure whether it’s naturalized in those counties because of people planting them, or whether it’s just more widespread and people aren’t reporting it. In any event, this rock cliff isn’t anyone’s garden, and however the plant took root, it certainly does look happy. Oliver’s poems are wonderful. She’s quite prolific, and I’ve found that, over time, I keep finding poems that I’ve passed over in the past, but that suddenly seem just right. Blue’s pretty no matter where it’s found, or how much of it there is: miles of Kerala hills, or a single hill country plant. I’m glad you enjoyed it. This is breathtaking Linda. I hope I’ll be able to see this flower one day, because from your image it seems to be gorgeous. Believe it or not, there are precisely two counties in Florida where the USDA map shows it native: Pinellas and Alachua. BONAP shows it as native in Florida, but indicates its presence in different counties as a waif species. Who knows? Maybe some displaced Texans put it in their gardens, and it escaped. In any event, if you’re ever in those counties in the spring, you might look for it. I tend to leave the wide, bluebonnet-filled fields to those with wide-angle lenses and better skills. But I do love the individual plants, or small groupings, and I’ll have more of that sort of photo in the medium future. Your comment about Oliver’s poem is so apt. Nature is far more than pretty decoration. And besides — if we stop to think about it, the world isn’t divided, with “human” here and “nature” there. We’re part of nature, too. Thanks Linda. The concept that we are all part of nature seems to have been popularized with the work of Baruch Spinoza and the term ‘pantheism’. ‘Pantheism’ derives from the Greek ‘pan’ (meaning “all, of everything”) and ‘theos’ (meaning “god, divine”). It just seems like Spinoza was one of the first to point out this similarity between God nature. To be honest, I have not been able to venture into any of the counties where the bluebonnet may dwell. Thanks for the information you gave me, however, because who knows I may very well go one of these days. When I saw this trio on the rocks, blooming for all they were worth, it took about two seconds for me to stop and tell them, “I’m going to make you famous!” Of course they’ll never be famous, but they’re appreciated, which may be better. Yesterday, I came across gaillardia, obedient plant, Herbertia, greenthread, rosinweed, and goldenrod. Perhaps it’s time to start talking about summer! I wonder if Timex ever considered having a knock-off group called the Indiglo Girls sing their jingles for them? That aside, the bluebonnet has to be one of the toughest plants I know. It’s beautiful along the highways, but it really shines when it’s taking a proverbial licking out among the cacti and rock falls. The best song that pays tribute to our state flower? Of course you can dance to it. Stunning photo, Linda, and the poem is pretty good, too! “Standing still and learning to be astonished” seems like a good way of experiencing this thing called life. It’s always nice to find a flower or two (or three) standing out from the crowd. Our capacity for wonderment seems to be diminishing — perhaps because we’re also losing the ability (or willingness) to be still. On the day I photographed these, I spent about seven hours traveling eighteen miles, and it still wasn’t slow enough to see everything there was to see. I always come home wondering what I’ve missed. This is perfection, Linda. And a beautiful matchup of words and image. Those bluebonnets certainly do seem to be standing at attention. Do you suppose they’re astonished by the sunlight, and the warmth of the rock? Perhaps they’re admiring one another, or delighting in the perfect spring breezes. There’s no way to know, but it’s fun to imagine. Oh, yes, I do love this poem! I am co-teaching a high school Sunday school class, and we gave ourselves (teachers and students) a homework assignment of intentionally loving our world and the people in our lives. I had thought to make copies of this poem to give the students when we report back. Gratitude and joy feed on each other…. How wonderful that you would consider sharing this poem. I found it touching, and true, and I think your class would enjoy it, too. Oliver’s poetry is extraordinarily accessible: which is to say it’s not convoluted, or filled with abstruse language or complicated metaphors. But it isn’t simplisitic, either, and grapples in its own way with some of the largest issues in life: love, grief, our place in the natural order, and so on. If you do use it, you’ll have to let me know how the class responded. Tomorrow is the beginning of your high holy days. A Blessed Easter to you, Gretchen, and a happy spring. We have two weeks off class because of Palm Sunday and Pascha, so I’m hoping it won’t be too late to share it when we return. It came to mind because of this post I wrote a while back https://gretchenjoanna.com/2013/07/10/what-the-world-needs-now/ and also, I just noticed, two years before that!! Such a beautiful poem, Oliver is just wonderful. And pairing with your photo and title – great idea! Actually, I’m not sure those bluebonnets had to work very hard. They seem to be more beautiful every year, with very little effort! I did have fun with the title. I hope at least one person assumed it was a grump about having to be at an office or workplace. I just hoped the caption beneath the photo would bring a double take, and a read of the poem. OK; it’s late and I’m sleep deprived so can’t afford to go on an oh-so-easy cyber search for some answers.. your bluebonnets look much like the lupines that grow in the Andes, and these beautiful fields of blue/purple flowers produce a round bean called ‘chochos.’ So I’m wondering if your bluebonnets produce beans, and if so, are they edible? “[Bluebonnets] face some challenges. They are eaten by a few animals, but not really by large herbivores. Lupinus spp. seeds do contain alkaloids that are poisonous if eaten in large quantities. Cattle and horses avoid eating bluebonnets almost completely. Deer will eat them in times of environmental stress when they are one of the few options left to eat. Sheep and goats, however, find them quite tasty and will clear a pasture of them. My country friends will make jelly from nearly anything — agarita, prickly pear, beautyberry, dewberry — but I’m not aware of anyone ever making bluebonnet jelly. I’ll have to make some inquiries, and find out why. Buenos dias! thanks for this feedback, which all makes sense. I had read that other parts of the lupine have toxins, and I suppose like the maracuya/passion fruit, some insects feed on the foliage with no harm and it provides natural protection from being eaten – much like the monarch and the milkweed… ditto for how certain animals seem to be immune to dangerous plants, and others are not. Seems, in my still-foggy awakening state, that the ruminants are perhaps the ones that have ‘iron guts.’ Our knowledgeable steve could probably clarify all of these topics! When I lived in natchez, I made a ‘fresh’ kudzu-flower jelly once out of curiosity.. if the flowers smelled so wonderful – like grape bubble gum, then it would surely be tasty? ha, add enough sugar and lemon to anything, and it’s going to have a nice flavor, so it turned out fine, but it’s best to stick to favorites, like a hot blackberry sauce! I came to a full stop when I read that kudzu flowers smell like grape bubble gum. So do the Texas mountain laurel: at least, to me. I discovered that they’re both in the pea family, and when I saw their seed pods, I wondered… Yes, indeed. The bluebonnets are in the pea family, too — but they don’t smell like bubble gum. It’s fascinating to contemplate the various relationships among plants and animals. I’d been musing recently that I’ve never seen a butterfly around bluebonnets, and sure enough: they aren’t able to pollinate the plants because of the flower shape. But flies, small bees, and bumblebees? Oh, my! I found the biggest bumblebees I’ve ever seen having a feast in a different field of bluebonnets. that is so interesting, and why i recently sent an image of a beautiful butterfly to someone who specializes inthe butteflies of the andes.. i wanted to be sure that i paired it with the correct flowers.. some of my friends think that i’m ‘too scientific’ at times, but to me, it’s important.. and someone like you or steve would quickly spot that the lovely butterfly really didn’t belong paired with a lupine!!! thanks for that tidbit of info! as for the kudzu flowers, there’s a great memory of returning to mississippi late one summer, and i was at an outdoor table at a restaurant in oxford.. my friend and i were having a great visit, and suddenly i straightened, followed that familiar scent and returned with kudzu flowers.. she cracked up laughing, and she did not know about that unique aroma either.. but once you can identify it, you don’t forget it! I got to smell mountain laurel for the first time this spring, and it was intoxicating. The friend I was with, who is the very essence of patience, finally said, “You can’t stay here forever, you know.” She persuaded me to leave by suggesting I might breathe in all the fragrance and not leave any for the bees and butterflies! that is so funny about your friend! I’ve sensed friends’ ‘tolerance’ when in archaeological museums, when they’ve seen enough, and I’ve barely started! that’s one reason I like to travel alone, so that I don’t hold others back or else feel guilty for holding them back! A beautiful poem by Mary Oliver, Linda! I planted a reblooming iris for your beloved Dixie Rose here, a variety called “Romantic Evening”; it is blue with an orange-red beard. I hope she would approve. :-) I don’t think it will bloom this year, as it is just getting established, but next year I will send you a photo. What a truly lovely, heart-touching gesture, Lavinia. It makes me happy just to think about it. The most amusing reminder of Dixie appeared a week ago. I was messing with my iPad settings when I couldn’t get the bluetooth keyboard to connect with it, and I suddenly discovered I had precisely one photo that had been saved. It was Dixie, asleep on the sofa. I have no recollection of taking the photo, or of saving it, but there it was. So, I made it into the background for my home page. I smile every time I see it.